The Whale Fishery and Killing the Bears, engraving from "Navigantium atque itinirantium bibliotheca," Volume 2, T. Woodward, 1744, John Carter Brown Library. 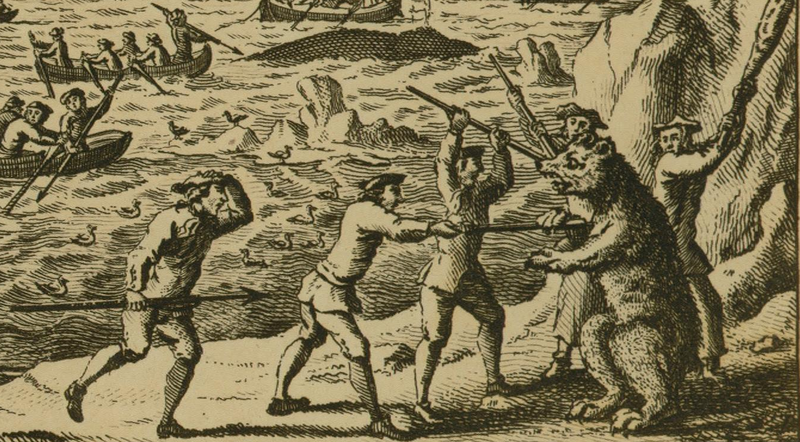 Whalers are only rarely featured on this blog. I would like to change that. 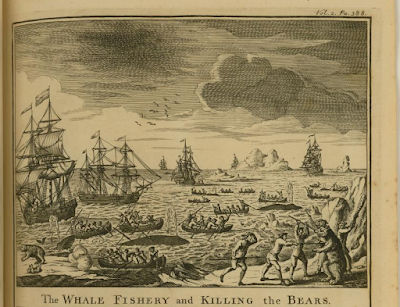 Today's print depicts a number of ships all harpooning whales and killing bears in the Arctic. The sailors all wear jackets which end about the top of the thigh. Their hats are a mixture of round and cocked, with a couple of caps thrown in for good measure. These tars attack a bear with harpoons and a comically oversized club. These men wear very small cocked hats, jacket that match the fellows afloat, and a mix of breeches and trousers.